No matter if you’re completely new to social media or if you’ve been in the industry for years, finding and reaching your customers on social media is hard. Firstly, you have to identify your customers. Who are they? What habits do they have? What interests? Assuming you’ve already done that, you now know at least a little bit about your customers and their habits. This will let you find them on social media more easily. Reaching your customers on social media does not only include finding them. It also includes reaching them in an interesting and appealing way so that they become interested in learning more about your brand. Also, as your existing customers and potential customers have something in common, these methods will be able to target them both. In this article, we’ll cover it all. This is one of the most, if not the most important part of reaching and retaining your customers on social media. If you’re sharing content that your audience has zero interest in, it won’t matter if you reach them, because they will look at your page then carry on, due to the fact that you didn’t share anything of value with them. Work towards becoming a thought leader in your industry because, in the long run, people will come to you as a result. This means sharing content that is relevant to your business and product but content that necessarily isn’t ads. For example, if you are selling dirt bikes, you might want to share the latest news within the dirt bike industry, because inevitably as a result, people will go to your page for the latest news, and those who are interested in the dirt bike industry who discover your page will begin following it. Everyone loves to feel remembered, loved and appreciated, so that’s exactly what you want to do with your customers. Remember dates that are important to them, for example, birthdays and wedding anniversaries. Send old customers private messages on social media or look up old customers on social media to see if they might have posted something about an important date. If so, send them a gift and apologize for getting the gift too late to them. Because hardly any other brands do this, they’ll love you forever. It’s called social media for a reason. You’re meant to engage with your audience. If you’re looking to reach people you don’t have as followers yet, that are potential customers in the future, you first need to find them and then engage with them. Hashtags can be really helpful when looking for your target audience. Most social media platforms have hashtags so why not use them? Try to think about keywords that are relevant to your niche that your customers might be using. 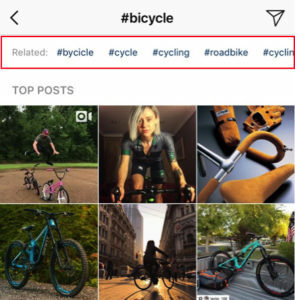 For example, if you’re selling bicycles, a relevant hashtag to search for is of course #Bicycle. When you search for hashtags on Instagram and on some other platforms as well, you’ll get recommended hashtags based on the hashtag you just searched for. This will let you come up with more tags that are relevant to the niche you’re trying to find customers in. Most social media platforms also have location check-ins, and this is another great way of finding your target audience. However, this time, you need to think about locations where your customers might be. Try to think about places where people perform their interest/hobby. This, of course, depends on which industry you’re in and what type of product you’re selling, as it won’t work for every niche. For example, if you’re selling paintball gear, searching for paintball courses in the location is a great way to find people who have a passion in paintball, and might be potential customers of your business. However, if you’re selling clothes, it might be harder to say an exact location where you should search. The next idea when searching for your customers in the check-ins is my favorite and the one I have found most effective. What you want to do is target events that are relevant to your niche, because obviously, people who are interested in the events will be people from your target audience. If you don’t know about any events related to your niche, try searching for your niche/industry + events. So if you were to search for fashion events, simply search “fashion events”. Now that you’ve found your customers, it’s time to start engaging with them, so they will be able to find your account. When you engage with them, they’ll get a notification, become curious, and check out your account. Here’s where it’s important that you have content that is appealing to those you engage with. In other words your target audience. Like a few posts of theirs, comment on a photo, or send a private message. Anything that gets them aware of your existence. Related: How to engage with your audience. Ads are a great way to reach your target audience on, and that’s because all you need to do is choose the characteristics of your customers when setting the target criteria, and pay of course. Then the ad takes care of the rest. All major social media platforms offer ads, and rich targeting criteria so you’ll only reach those who are truly relevant to your brand. Simply choose the platform that is most relevant to your business and where your customers are spending the most time. Again, it’s important that you know a lot about your customers so that you can choose the right criteria when making the ads, and thereby getting the most out of your marketing budget. The more targeted you make your ads, the more relevant people you’ll reach. A bold move to some, but it has actually shown to be very beneficial to brands. When using this method, you change roles. This time, you make your customers come to you instead of the other way around. This method also means that you’ll first and foremost redirect your existing customers from your website/store, and not attract new ones – even if it will do that as well. But that doesn’t mean that taking your customer service to social media isn’t beneficial for your brand. In fact, 70% of buying experiences are based on how the customer feels they are being treated. Taking your customer service to social media has several benefits. First of all, you let people know that you are active on social media, which will lead to more followers. Secondly, studies found that brands tend to respond quickly to customers on social media because it’s so easy to use. And you all know that quick responses are extremely important for happy customers, and more importantly, getting returning customers. In fact, many people now demand and expect brands to have customer service on social media, as 67% of consumers now tap networks like Twitter and Facebook for customer service. But that’s not all. Nielsen has found that 33% of customers even prefer to contact brands using social media rather than the telephone, so if you don’t use social media for customer service, you might be missing out on some valuable opportunities. If you’re not using social media for customer service and ignore your customer’s inquiries, you are missing out. Big time. An estimated $41 billion is lost by U.S. companies alone each year due to poor customer service.